We love Thanksgiving at Lara Metz Nutrition. We are dietitians who love food, coming together and making the most of time off with family and friends. It’s been a tremendous 10 months of growth for us. We decided to take pause to dedicate November to mindfulness and gratitude, so it seems appropriate to reflect on all we are grateful for as we prepare to sit at our feasts. Our sincere thanks goes out to our community. It is truly a privilege to share in your wellness journey and cheer on all of your success. As a gesture of our gratitude, we’re sharing our favorite recipes (we’ve been eating pumpkin muffins for a week! ), in hopes that you’ll enjoy them as much as we do. I absolutely love Thanksgiving! I love the lazy morning with my husband and children, snuggling in bed while we watch in awe the beautiful Macy’s Thanksgiving Day Parade. Then rain or shine, snow or sleet we go out for a family walk. 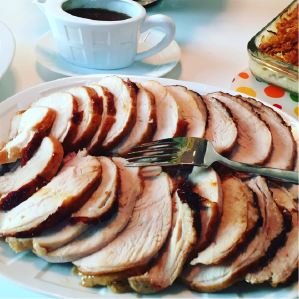 As a self-proclaimed recipe addict, I spend hours upon hours researching and searching the web for new recipes and ideas for our Thanksgiving meal. I am Thankful that my mother in law is hosting this year and I’m excited to prepare two delicious dishes. I dream about my recipes, knowing guests find such pleasure during their Thanksgiving meal. This year I am especially thankful for my clients who trust me and my amazing team and allow us into their homes and to be part of their health journey. Preheat oven to 325°. In a small bowl combine apricot preserves, vinegar and pepper. Season the turkey breast with Kosher salt and place the turkey breast on a rack in a large shallow roasting pan. Bake, uncovered, 1-1/2 to 2 hours or until a thermometer reads 170°, basting every 30 minutes with apricot mixture. (Cover loosely with foil if turkey browns too quickly.) Cover and let stand 15 minutes before slicing. Clean and peel outer leaves of sprouts. Continue to peel the leaves or slice in half. Heat oil in a heavy pan over medium high heat. Add the Brussels sprouts. Stir every few minutes until they are tender. 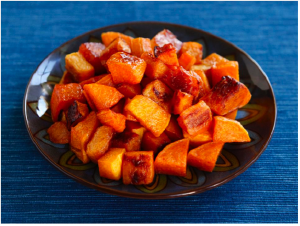 Cinnamon roasted squash is a recipe fit for everyone at our table — it’s gluten free, dairy free, kid-friendly and vegan so everyone can enjoy it. The sweet cinnamon helps cut down on the need for added sugar too. Make extras of this recipe, as leftovers can be added to salads, made into a mash, or even mixed into plain yogurt. Heat oven to 425. Spray 2 large baking sheets with non-stick cooking spray. Toss the squash with the olive oil, brown sugar, cinnamon and salt until well coated. Pour the squash on to the baking sheets and spread out until one layer is formed. Roast for about 40-45 minutes, or until the edges of the squash cubes are lightly browned, turning once about halfway through cooking time. Thanksgiving to me is a time to recognize, honor and celebrate all of the blessings of our lives alongside family, friends and healthful foods. In my home, Thanksgiving begins on Monday, with the first of the cooking and preparation, anticipation and celebration. Monday is the day when I prep my grandmother’s pumpkin chiffon pie as well as the easiest make-ahead side dish that, in my opinion, is the jewel of the table and completes the turkey: cranberry apple relish. It’s as simple as throwing all the ingredients in a saucepan, bringing to a boil, and simmering for 15 minutes. Yet, in that short time, the smell of cinnamon, ginger, and freshly grated nutmeg (an impromptu addition to this year’s recipe as suggested by my daughter) begins to emanate throughout the house and the holiday season officially begins. When cooked from scratch, cranberry apple relish is an antioxidant powerhouse, full of cancer-fighting anthocyanins, vitamin C and heart-healthy fiber. This recipe modifies an old favorite, changing the 1 cup of sugar to 2/3 cup of pure maple syrup. Yes, still a form of sugar, but less processed than refined sugar, plus it offers small amounts of calcium, potassium, iron and zinc. 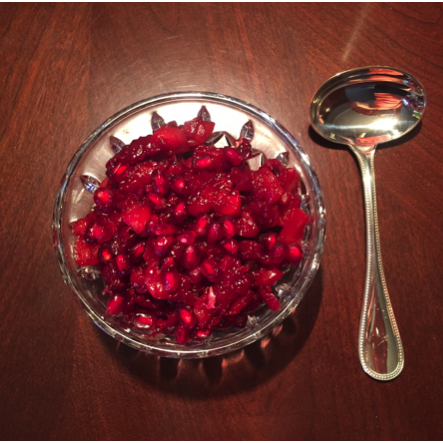 To boost the nutrition even further, I added pomegranate arils, which offer great crunch and texture. May you have a joyful Thanksgiving alongside family, friends and an abundance of healthful foods. There is nothing about food that I don’t love. I love eating. I love cooking. I can’t get enough of learning how different families celebrate holidays and rituals with food. It’s funny that I’m not usually that excited about the food at my own Thanksgiving Day feast. I guess that’s because I practice what I preach and the food really is secondary on this day of family, friends, our ritual football game, time together in the kitchen, and the great clean up pallooza. Don’t get me wrong, I love the meal, but I focus less on my plate and more on the humor of the bird that took two hours less to cook than planned, and the kid who lost a tooth in cranberry sauce. 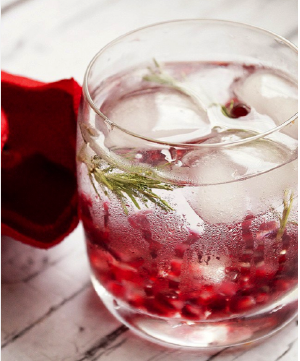 Rather than the usual side dish, I’m sharing tonics that will help soothe your stuffed-self and help you bypass the Alka Seltzer this year. I tell all of my clients to keep stemware in hand if they’re triggered by all of the decadence that abounds. Fancy mineral water, aka Thanksgiving Spa Water, will make you feel celebratory with antioxidant powerhouse nutrients and hydrating benefits. The Tea Digestif will help you to say “yes” to something you feel good about at dessert, while helping the feast settle. What you drink can help you feel empowered the whole day. Cheers to a delicious, memory making Thanksgiving, and cheers to you and your healthy celebrating self!